This is my healthy twist on the childhood classic. Kids (and grown ups!) will love this more nutritious version- it’s the perfect texture, full of antioxidant rich cacao flavour and, of course, it turns the milk chocolatey too. The sneaky vanilla powder makes it taste extra sweet without using loads of sweetener and the quinoa pops will fill little ones with loads of energy and a protein boost too. I recommend doubling the recipe, they’re that good! Preheat the oven to 160’C. Add the quinoa pops to a large bowl. In a small bowl, combine the cacao powder and vanilla powder and mix well. In a small saucepan on medium heat, melt together the coconut oil and honey/maple syrup. Stir in the cacao/vanilla powder and whisk well. 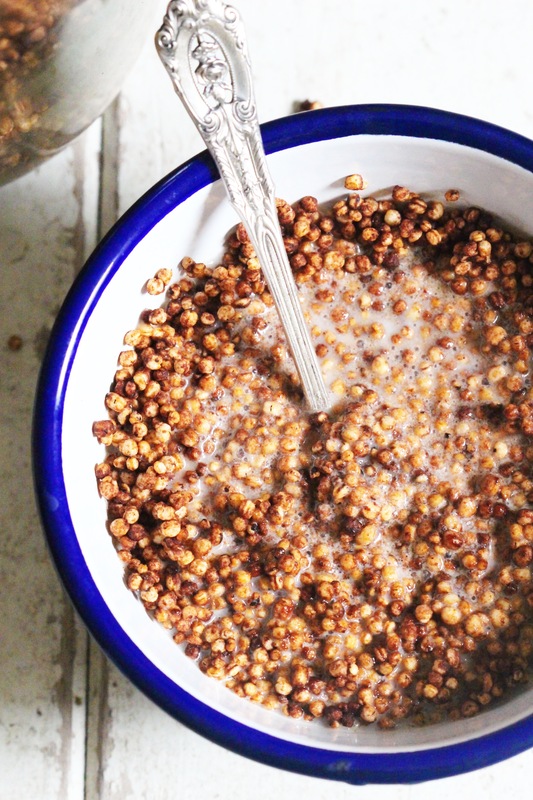 Gradually, while mixing the quinoa pops, pour the chocolate mixture into the large bowl. 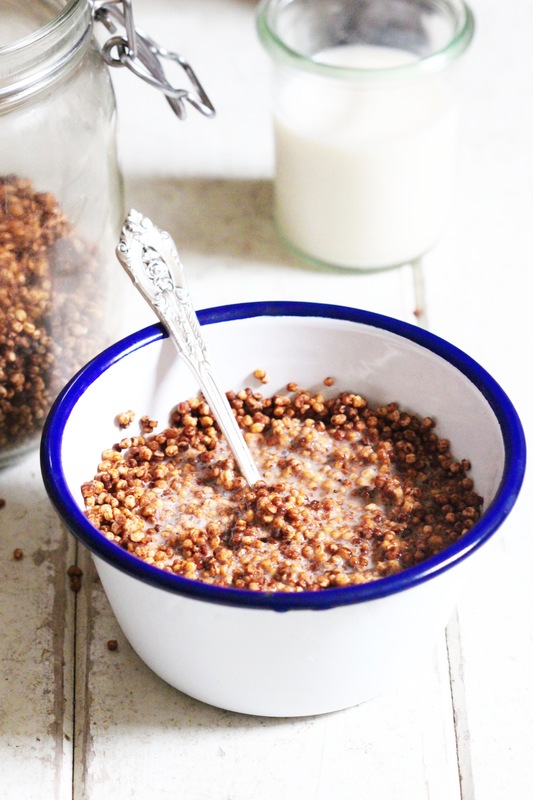 Keep mixing the quinoa pops until they’re all evenly chocolatey. Spread the mixture out evenly on a baking sheet lined with parchment paper and bake at 160’C for 8-10 minutes, just until dry and crisp. Toss once in the middle. Leave to cool completely, then store in an airtight jar. What a cool idea! I would have never thought to do this. Yum! I made these and they are yummy! Have you ever tried to puff the quinoa yourself?